Ballochroy, Kintraw and perhaps others were very probably sites intended to enable the day of the solstice to be identified directly. However in order to observe the very small daily movement near the solstice, very long alignments are required. Inevitably the altitude will be low with resulting possible refraction uncertainties. However there is a much easier method. This involves arranging an alignment such that a limb of the sun is at a chosen feature a few days before the solstice. Counting the days until the sun repasses the feature and then ‘halving the difference’ enables the day of the solstice to be identified. After seven days the sun is 10ʹ of arc from the solstice and its daily movement is about 3ʹ of arc. After 12 days the sun has moved its own diameter of 32ʹ of arc and its daily movement is 5ʹ of arc. In general the upper limb is used. Point 1. avoids ambiguity about which limb to observe since the sun has moved less than its own diameter. Point 2. Follows from 1. 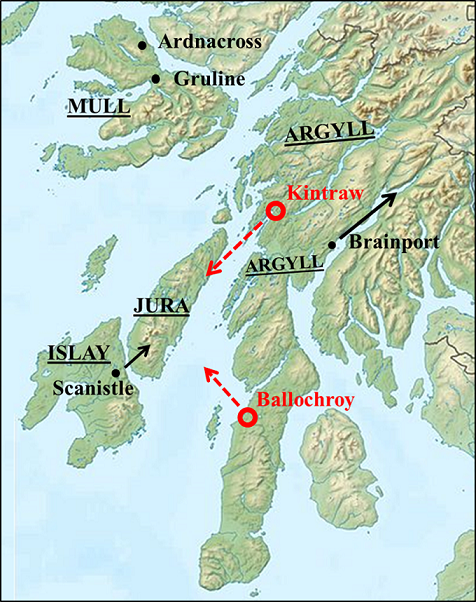 The map shows Ballochroy and Kintraw, both discussed above. The four sites in the region for halving the difference are shown. Essentially all standing stones sites in this region have been investigated and it is believed that are no further examples are to be found in it. However there are many other regions that would merit similar thorough investigation, including Wales, Cornwall and south west Ireland. A preliminary investigation in the last mentioned yielded two examples.